In an effort to cover up perceived laziness, we at SCP have changed direction regarding our coverage of the 24 heures du mans. Several stories were already in the can but mostly out of indifference ( see income structures, emotional outbursts, weather reports, Monterey Pop, cash flow and a lack of A-Ha grinds ) we thought it would make for an interesting read as to how things were before it all went down instead of after. I present now exhibit A�. �Le Mans has always been a dream of mine; I suppose I�ve wanted to drive here almost since I first heard of the place.� Matthew Marsh, a British expatriate living and working in Hong Kong, is no stranger to long distance racing, having competed for many years in events such as the day-long Nurburgring production car affair and the similar 24-Hour Spa event. 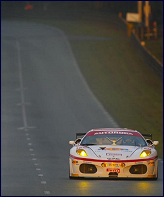 He is also a talented sprint competitor as well who won the Porsche Asian Carrera Cup Championship in 2004. Yet, for Marsh Le Mans this weekend is something else, for here on the Sarthe circuit he is a rookie, and perhaps more importantly, a rookie driving a very unfamiliar automobile, a GT2 category Ferrari 430GT entered by the Italian organization GPC Sport SRL. The team is typical of many of the smaller privateers that are a tradition at the 24 hours which generally get lost in the clutter of the headlining prototypes and large GT1 entries. For Marsh, a man with hundreds of hours in Porsche 911s, as well as Formula Fords and other single seaters, none of that matters. �Even though it�s been my dream, the reality is that it is another, if very important, race, and I have to come to grips with it as I would any other.� Coming to grips for the Hong Kong resident has been somewhat complicated by the fact that the GPC camp similarly has been learning about its new Ferrari, and doing it on a track that has been more rain soaked than it has been dry. In addition, Marsh has had to adjust to the very different styles of his teammates Carl Rosenblad of Sweden and Jesus Diaz Villaroel of Spain. Understandably, few other than the team and its sponsors will be paying much attention to Marsh and his Ferrari, their focus being elsewhere on the expected titanic battle between the Audi and Peugeot diesels, and the counterpart war between the Corvettes and Aston Martins in GT1. Still, without people such as Marsh and their enthusiasm for the classic long distance race, Le Mans most likely would not continue to exist, much less prosper, which is why in the end they are as important as the high dollar teams up front.